Explore the hidden corners of the world and find out some interesting and exciting historical facts related to the world. Enlighten yourself with the worldly knowledge that otherwise remains unknown to everyone that helps you to be a true traveler. 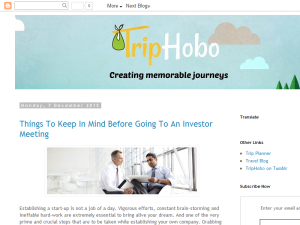 This what your Trip Planner - Travel Blog Blog Ad will look like to visitors! Of course you will want to use keywords and ad targeting to get the most out of your ad campaign! So purchase an ad space today before there all gone! If you are the owner of Trip Planner - Travel Blog, or someone who enjoys this blog why not upgrade it to a Featured Listing or Permanent Listing?